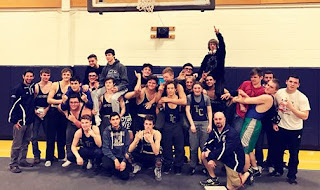 The Tri-County Regional Cougars wrestling team captured the Mayflower League Title with a 48-27 victory over the Bristol-Plymouth Regional Craftsman last night. Earning pins for the Cougars were Cole Guertin, a sophomore of North Attleboro; Patrick Griffin, a sophomore of Franklin; Phil Hulbig a senior from North Attleboro; Drew Hansen, a junior from Plainville; Bobby Fryar, a senior from Plainville; Hashim Lopez, a junior from Walpole; and Dominic Parrella, a junior from Medway. The Cougars are now 12-1 for the season. The team will wrestle again this Saturday, January 20th, at the Cape Cod Invitational at Sandwich High School, Sandwich, MA.